Here we introduce a high-level overview of the process used to grow graphene by Chemical Vapor Deposition (CVD). At a very basic level, growing graphene involves two steps: 1) synthesis on a catalyst substrate; and 2) transfer to a target substrate. Though many substances can be used as a catalyst to grow graphene by CVD, copper or nickel foils are typically used, copper in the case of monolayer graphene and nickel in the case of multilayer. 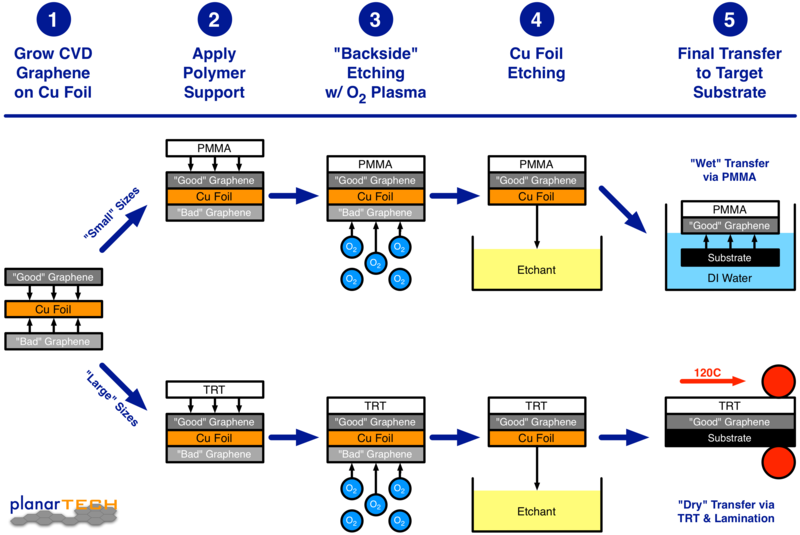 The image below left shows an overview of the main steps from start to finished transfer, and the slideshow below right shows a walkthrough of the entire process for growth on copper foil.